This is a short version of "The Way to Peace: Israeli Victory, Palestinian Defeat," Commentary, January 2017. Netanyahu carrying John David Lewis' Nothing Less than Victory. 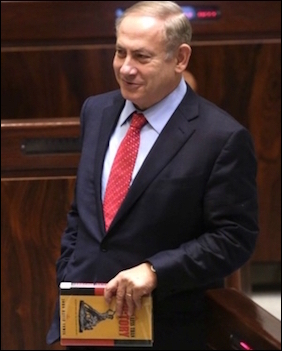 Israel's Prime Minister Binyamin Netanyahu was photographed on Dec. 21 carrying a copy of Nothing Less than Victory: Decisive Wars and the Lessons of History by John David Lewis (Princeton University Press, 2010). In that book, Lewis looks at six case studies and argues that in them all "the tide of war turned when one side tasted defeat and its will to continue, rather than stiffening, collapsed." That Netanyahu should in any way be thinking along these lines is particularly encouraging at this moment of flux, when Sunni Arab states focus as never before on a non-Israeli threat (namely the Iranian), Obama's leaving Israel in the lurch at the U.N. Security Council, and insurgent politics disrupt across the West. In other words, the timing's exactly right to apply Lewis' argument to the Palestinians. Actually, Israel successfully pursued a strategy of forcing the taste of defeat on its enemies through its first 45 years, so this would be a return to old ways. That strategy starts by recognizing that, since the Balfour Declaration of 1917, Palestinians and Israelis have pursued static and opposite goals. The Palestinians adopted a policy of rejectionism with the intent to eliminate every vestige of Jewish presence in what is now the territory of Israel. Differences among Palestinians tend to be tactical: Talk to the Israelis to win concessions or stick to total rejectionism? The Palestinian Authority represents the first approach and Hamas the second. Deterrence underlay Israel's formidable record in 1948-93 of strategic vision and tactical brilliance. On the Israeli side, nearly everyone agrees on the need to win acceptance by Palestinians (and other Arabs and Muslims); differences are again tactical. Show Palestinians what they can gain from Zionism or break the Palestinians' will? Labor and Likud argue this out. These two pursuits – rejectionism and acceptance – have remained basically unchanged for a century. Varying ideologies, objectives, tactics, strategies, and actors mean details have varied, even as fundamentals remain remarkably in place. Wars and treaties come and go, leading to only minor shifts. Deterrence, that is, convincing Palestinians and the Arab states to accept Israel's existence by threatening painful retaliation, underlay Israel's formidable record in 1948-93 of strategic vision and tactical brilliance. 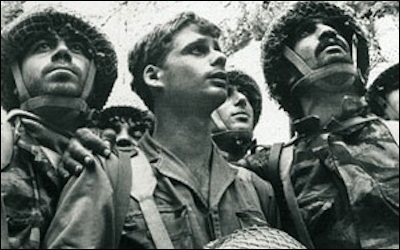 Israeli soldiers during the 1967 war. That said, deterrence did not finish the job; as Israelis built a modern, democratic, affluent, and powerful country, the fact that Palestinians, Arabs, Muslims, and (increasingly) the left still rejected it became a source of mounting frustration. Israel's impatient, on-the-go populace grew weary with the slow-moving and passive aspects of deterrence. That impatience led to the diplomatic process that culminated with the handshake confirming the signing of the Oslo Accords on the White House lawn in September 1993. Those accords, however, quickly disappointed both sides. Things went so wrong in part because Yasir Arafat, Mahmoud Abbas, and the rest of the Palestinian Authority leadership pretended to abandon rejectionism and accept Israel's existence but, in fact, they sought Israel's elimination in new, more sophisticated ways, replacing force with delegitimization. Israelis entered the Oslo process believing that war can be concluded through goodwill and compromise. In part, too, the Israelis made a profound mistake, having entered the Oslo process with a false premise that war can be concluded through goodwill and compromise. In fact, Israeli concessions aggravated Palestinian hostility. The Oslo exercise showed the futility of Israeli concessions to Palestinians when the latter fail to live up to their obligations. By signaling Israeli weakness, Oslo made a bad situation worse. What is conventionally called the "peace process" should more accurately be dubbed the "war process." This brings us to my key concepts, victory and defeat. Victory means successfully imposing one's will on the enemy, compelling him through loss to give up his war ambitions. Wars end, the historical record shows, not through goodwill but through defeat. He who does not win loses. Thinkers and warriors through the ages concur on the importance of victory as the proper goal of warfare. For example, Aristotle wrote that "victory is the end of generalship" and Dwight D. Eisenhower stated that "In war, there is no substitute for victory." Technological advancement has not altered this enduring human truth. Israel has just one option to win Palestinian acceptance: a return to its old policy of deterrence, punishing Palestinians when they aggress. Deterrence amounts to more than tough tactics, which every Israeli government pursues; it requires systemic policies that encourage Palestinians to accept Israel and discourage rejectionism. It requires a long-term strategy that breaks the will and promotes a change of heart. The goal here is not Palestinian love of Zion but closing down the apparatus of war: shuttering suicide factories, removing the demonization of Jews and Israel, recognizing Jewish ties to Jerusalem, and "normalizing" relations with Israelis. Palestinian acceptance of Israel will be achieved when, over a protracted period and with complete consistency, the violence ends, replaced by sharply worded démarches and letters to the editor. Israeli victory frees Palestinians to improve their own lives. Ironically, an Israeli victory liberates Palestinians by compelling them to come to terms with their irredentist fantasies and the empty rhetoric of revolution. Defeat also frees them to improve their own lives. Unleashed from a genocidal obsession against Israel, Palestinians can become a normal people and develop their polity, economy, society, and culture. That said, this change won't be easy or quick: Palestinians will have to pass through the bitter crucible of defeat, with all its deprivation, destruction, and despair. There is no shortcut. For Washington to be helpful means supporting Israel taking tough steps. It means diplomatic support for Israel, such as undoing the "Palestine refugee" farce and rejecting the claim of Jerusalem as the Palestinian capital. Israeli-Palestinian diplomacy is premature until Palestinians accept the Jewish state. The central issues of the Oslo Accords cannot be usefully discussed so long as one party still rejects the other. But negotiations can re-open and take up anew the Oslo issues if and when Palestinians accept the Jewish state. That prospect, however, lies in the distant future. For now, Israel needs to win. Daniel Pipes (DanielPipes.org, @DanielPipes) is president of the Middle East Forum.